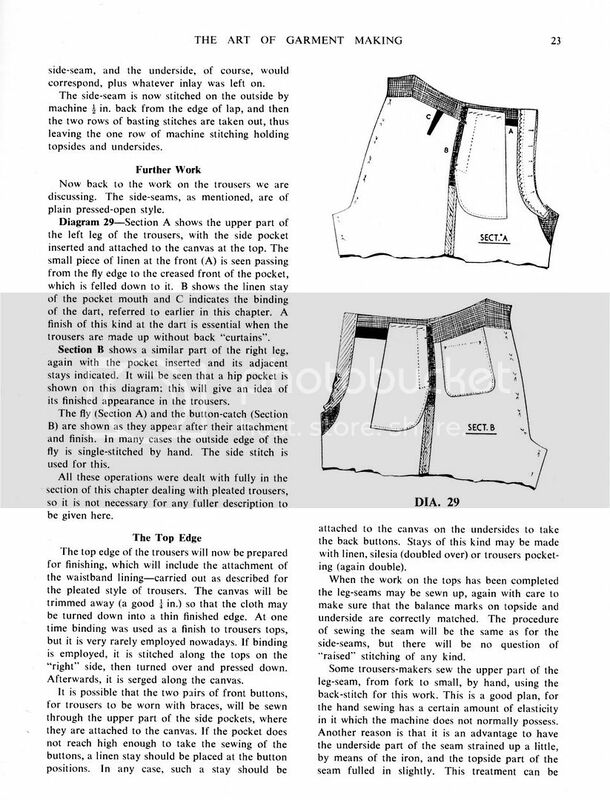 I thought I would post this after the publication of David Page Coffin's new book on trouser making. The contrast between them is fascinating. David's principle aesthetic concern is summed up by the phrase "less is more" - slim and sleek finished edges, and lack of bulk. 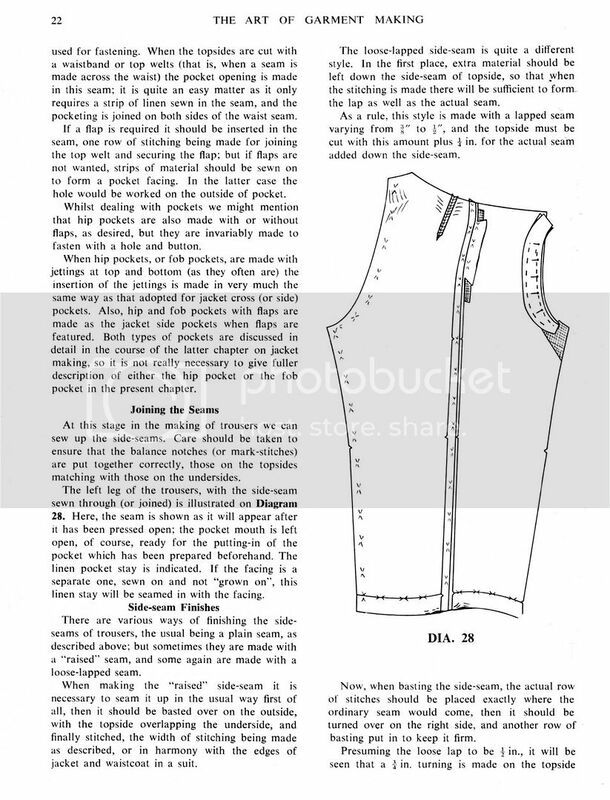 Some of this may be influenced by pursuit of a lighter sort of tailoring by women's tailoring houses. 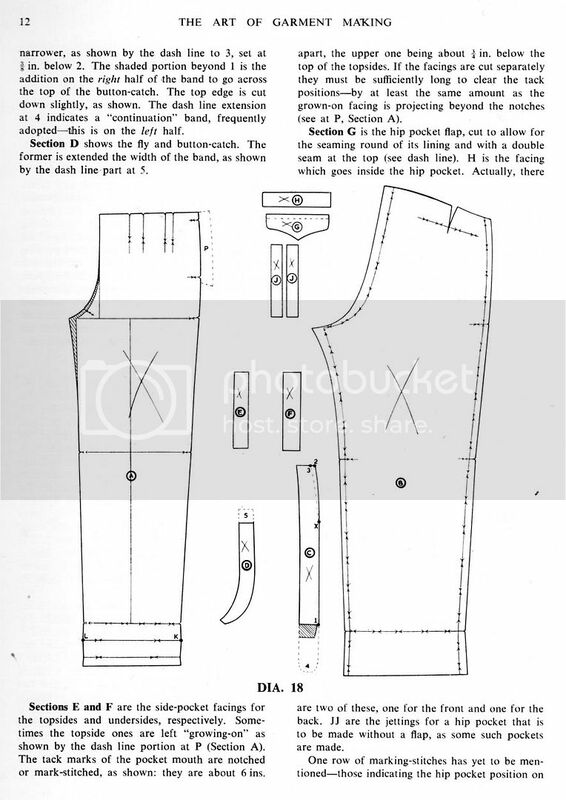 The Tailor and Cutter approach is a more classically structured with a curtained waistband lined with linen canvas. 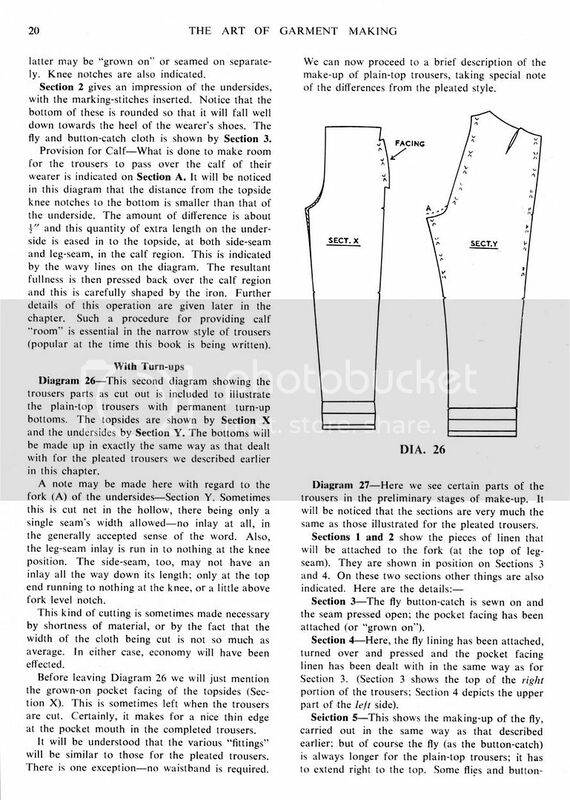 I also like their preference for brace trousers. Marvelous stuff, thanks, Sator. I've got this book but it's so much easier to read on screen. 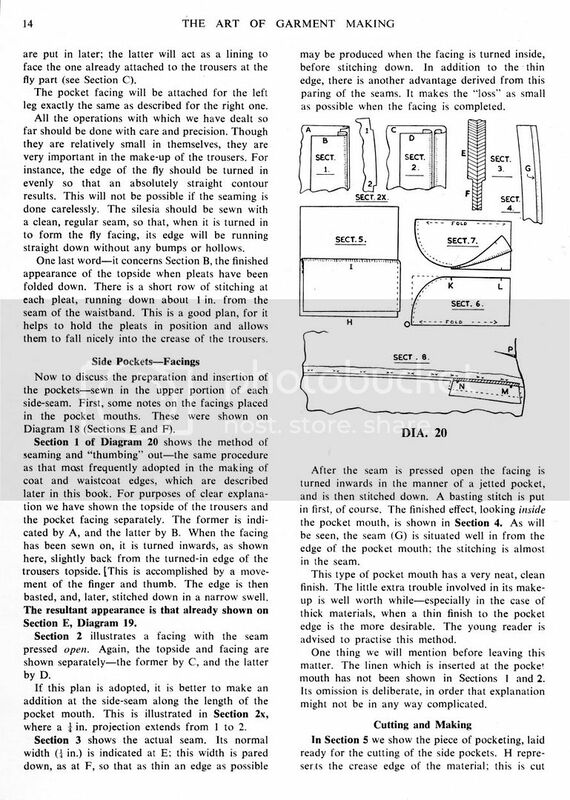 It's like listening to Stan Hostek talk, since he uses all the same jargon: "spring," "grown-on" (he says "growed-on"), "fair," fulled on…" I guess I have been influenced by women's tailoring, but more consciously and directly just by modern men's construction, such as I've seen, which seems to be blurring the distinction. 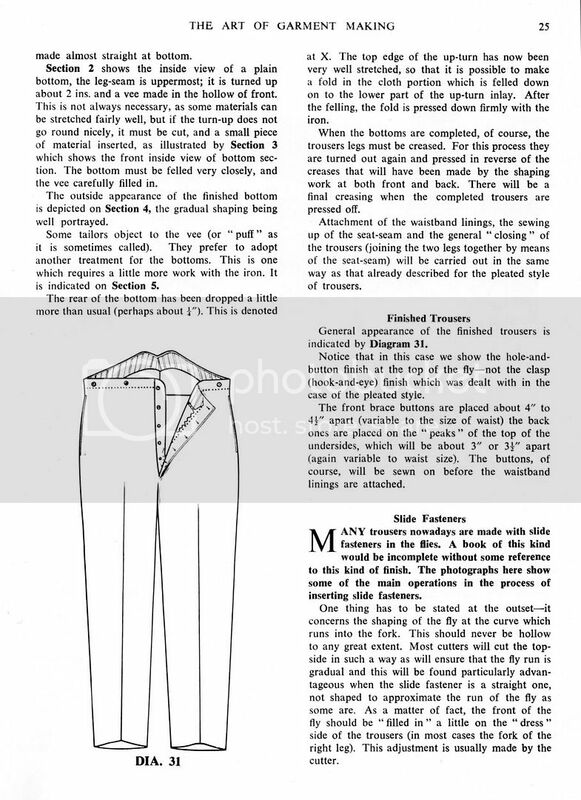 I'd love to somehow observe a fresh, new pair made as described here on the figure it was made for and demonstrating all the subtle points of shaping deemed essential by this text, compared to a modern garment that doesn't include them. But alas, I haven't the skills or experience to do the job myself. 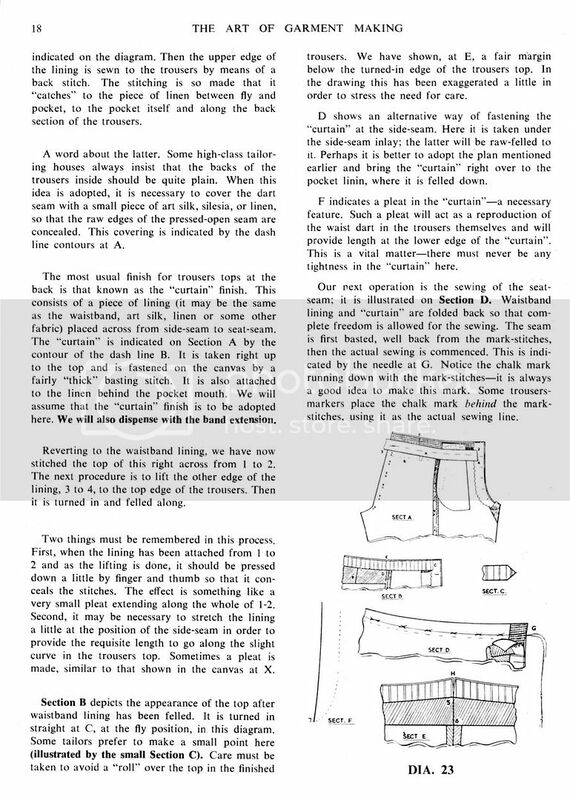 I'd love to somehow observe a fresh, new pair made as described here on the figure it was made for and demonstrating all the subtle points of shaping deemed essential by this text, compared to a modern garment that doesn't include them. 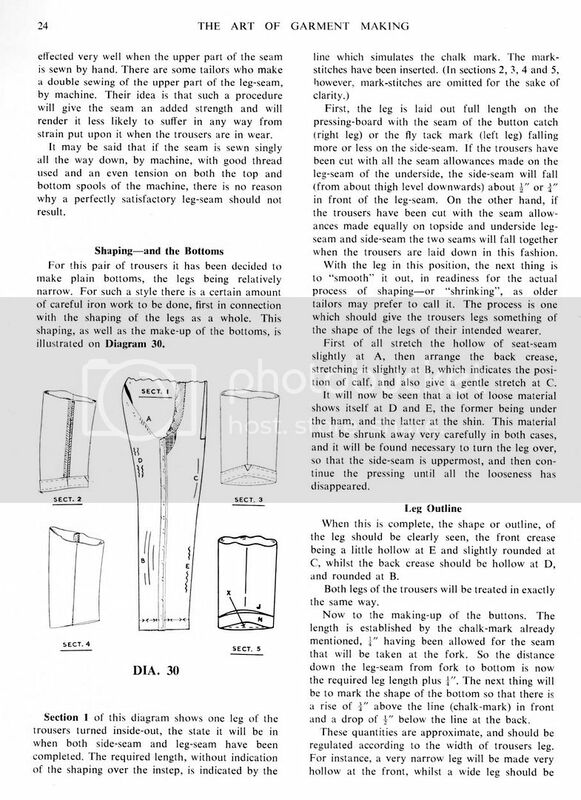 Actually I am about to start a pair of trousers for a Morning suit for a customer. 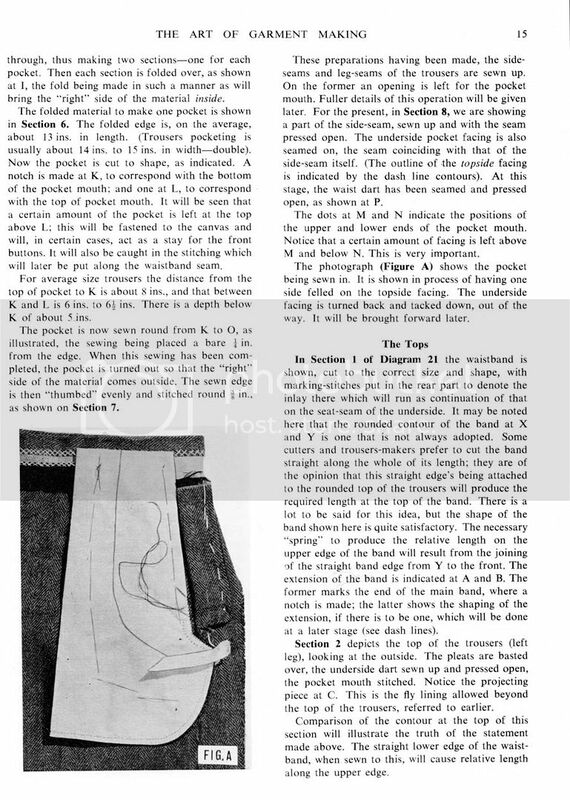 If you like I will take pictures of the progress and details on manipulating the fabric. I started taking photos of the construction process we use, which is very similar to what is posted here, but haven't completed it since I had to get the trousers done for a deadline and the picture taking was left behind after a certain point! I'll see what I have so far. "Like" doesn't quite cover it; I'd LOVE it!! Many thanks for anything you'd care to share. 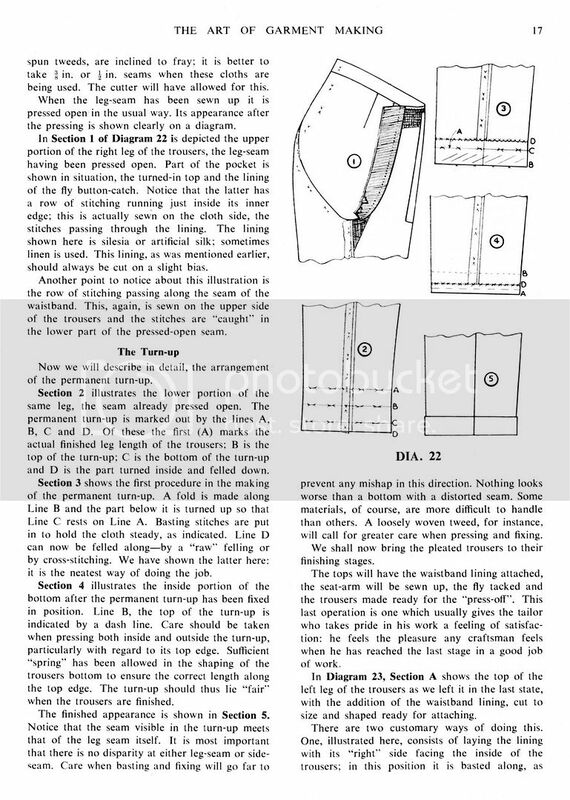 I have to agree with dpc that the lines have been blurred between contemporary tailoring techniques and those traditional methods learned years ago while a humble apprentice. I'm sure that much of it has to do with changes in materials as well as client requests. I would love to have a pictorial review of how someone else approaches the methods suggested above... not only for technical insight, but also as a way to review any time-saving steps to the process. I've just ordered Coffin's books, can't wait for them to arrive. So, I have a question. 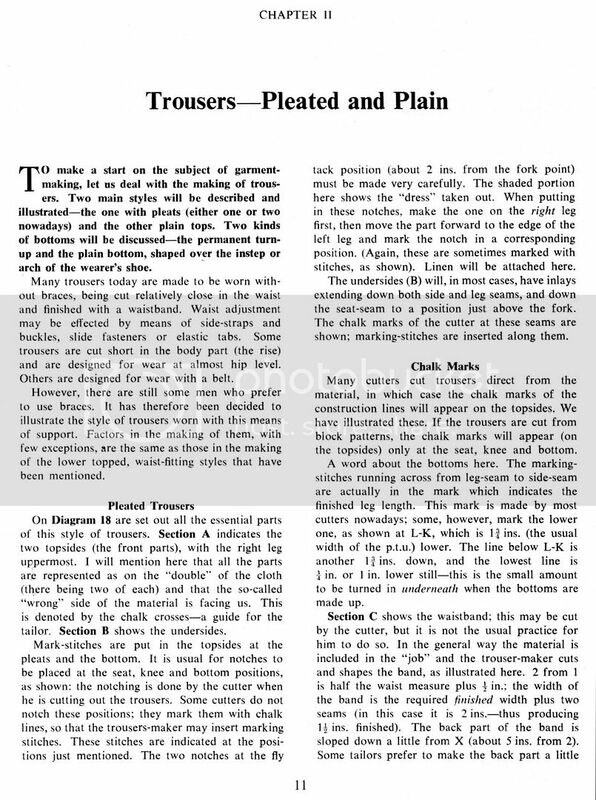 I'm about ready to undertake my first pair of "plain top" trousers. 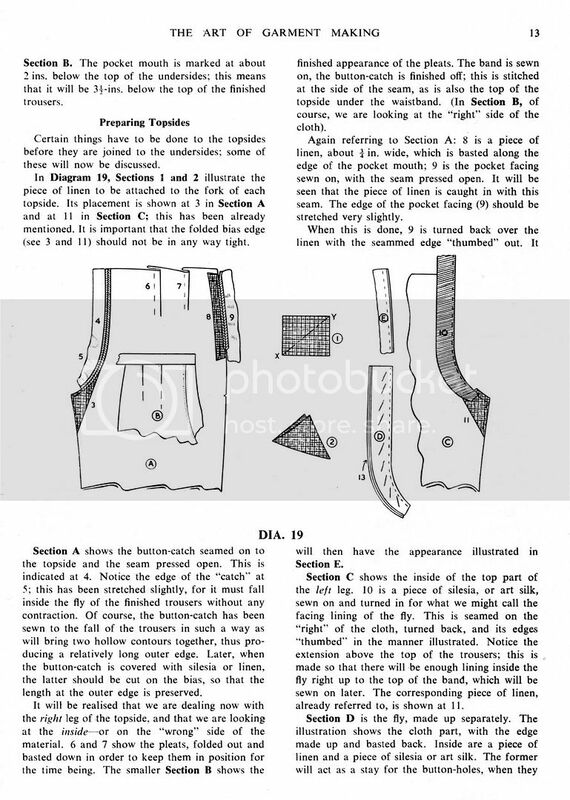 The problem with this is that there's no waistband. Which might seem like less of a problem, but I'm confused about one point, the canvas. 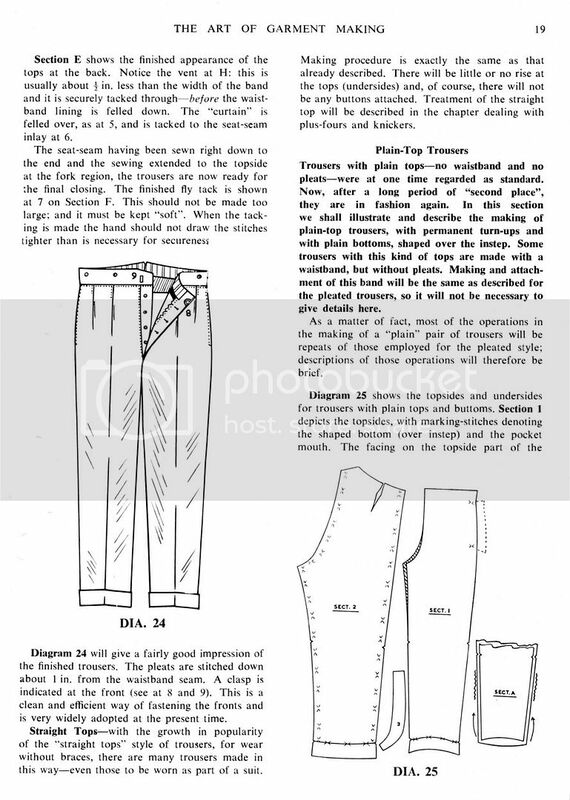 In trousers with a waistband, the canvas is held in place by enclosing it within the waistband seam allowances and cross-stitching those allowances to the canvas. 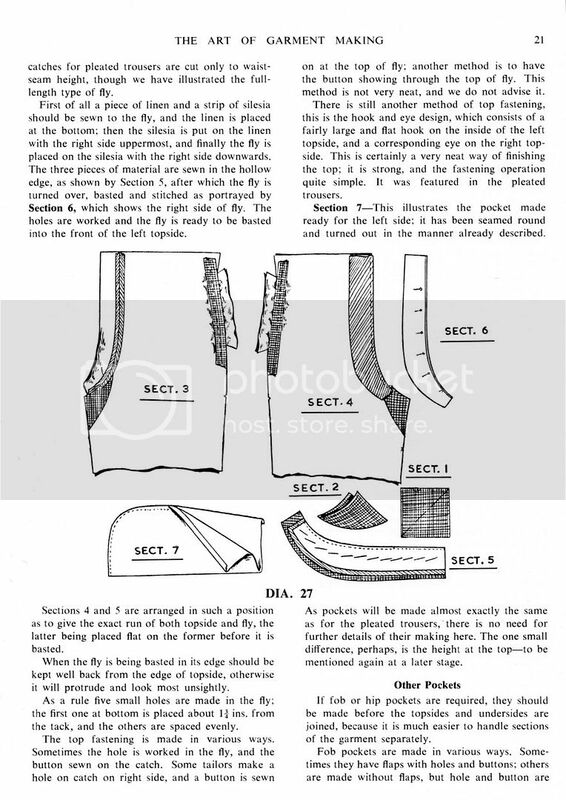 However, as one may see on page 23 of the above description there are no seam allowances to hold the canvas in place. 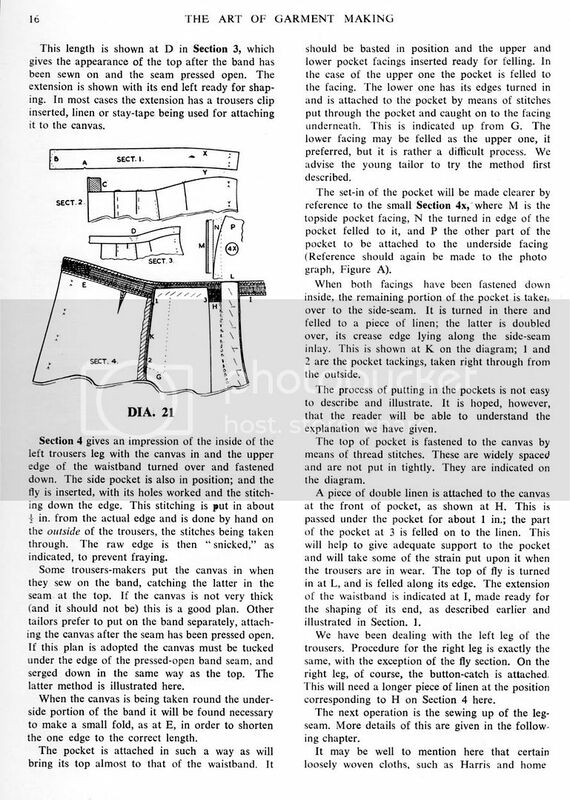 It does eventually say to cut a quarter inch of canvas away and turn the cloth down, but I'm confused what that means as well. Should I cross stitch that to the canvas? It seems that there's nothing to hold the canvas in place. Will someone help me understand these procedures better? You are correct in your assumption, you turn over the fabric and cat-stitch/cross stich it down. For a little more added support a top stitch is sometimes placed about where the bottom of a waistband would reach. Great, thanks, hadn't noticed that one. I just figured he had possibly taken lots of nice pictures when he made the pair referenced previously. The post is pinned at the top of this forum. It took me about two or three nights to translate it all. Once again, many thanks. Sorry; I don't know how I missed that post. No that was my fault, by the time I remembered to start taking pictures I had already stayed and faced the fly, any details of importance including first press was already past. My apologies. Perhaps next time as I need to document a step by step anyway for a future work.